We found out recently that Moriel is up North in a military prison, where he will be detained for the next ten days. After that they will presumably release him in order to allow him the chance to change his mind and enlist. Then, the process will start over and then… we’ll see. Moriel is feeling good and calm. When he called, he said, “Everything is as it should be.” Thanks for all of the support, love and inquiries. I will continue to update this lil blob as information comes in. Also, I thought I might upload some pictures of some famous refusers. 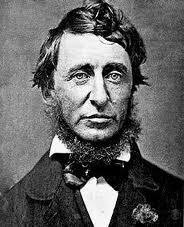 Here is a picture of Henry David Thoreau looking – as he tended to – especially wild-eyed. is Mori bening held with reservists (generally not so bad, mostly guys whod idn’t turn up for duty) or with regular soldiers (a more mixed bunch, some of whom may actually deserve to be in jail)? In addition to being impressed by Mori’s resolve, I’m impressed by the amount of press this is getting, now with a Haaretz article! Being unfamiliar with most things Israel, I’m curious: Is it quite unusual to conscientiously object in Israel, or does Mori have a particularly good PR campaign (perhaps helped along by the excellent blogging here), or is there something else about this particular situation that’s newsworthy?